AddressThe address for this sale in Thousand Oaks, CA 91362 will no longer be shown since it has already ended. 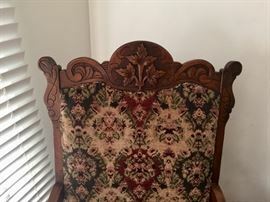 Cash only for each item sold; new owner will need to bring help in loading large antique pieces; new owner will be responsible for any accidents or damage after purchase of items. All of my antique pieces were made in the 19th century of solid, custom, carved oak wood. Will be moving out of state and will only have these items up for sale from now till November 4th, 2018. To view these fine, antique, furniture pieces, please email for appointment only. Thank you. 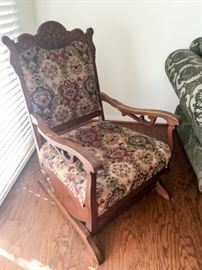 Victorian oak, carved rocking chair is made of solid wood construction. This piece was made circa 1900 and has a lovely carved, oak, leaf detail at the crest.